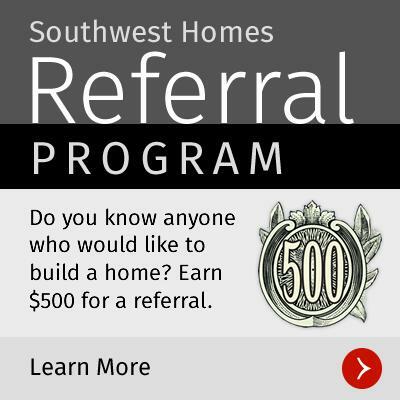 Where does Southwest Homes build? We build on your land throughout Texas, Arkansas, Missouri, and Louisiana. Have land? We'll travel. Can we personalize our SWH home? Yes you can! Southwest Homes allows you to personalize one of our plans to fit your needs and desires, or we will build the plan that you provide. We also offer numerous upgrades and options to further personalize your Southwest Home. Does Southwest Homes provide financing? Southwest Homes has lenders with conventional, FHA, VA, USDA and non-conventional financing who offer construction and 100% permanent loans with NO Construction Loan Interest Payments during construction. Can our land be included in the financing? Yes, in most cases it can! Many of our customers include their land and save money by combining the two. We can also include utilities, well, septic and certain other improvements as well! Every project is unique. Our commitment to you is that we will build your new Southwest Home in a timely manner, to ensure your homebuilding experience is enjoyable.